I've had a really busy week. 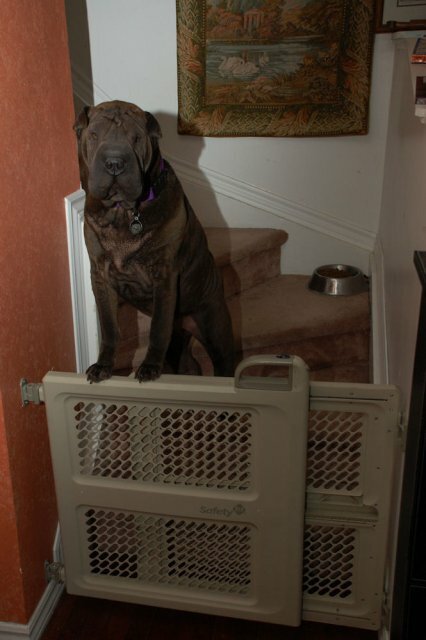 Everyone is still sick with colds and all that fun stuff so you can bet I've been standing on guard making sure no more cold sickies get in the house! I'm also exhausti-pei-ted from looking after my people. I had to delegate yesterday. Puppy had to go to the Emergency Vet. So I sent Stuffy with him. Seems like Puppy was having trouble breathing so his Vet said to Mom, Take him to the Emergency Vet and they will make him better. Stuffy reports that Puppy had to wear a mask like this for a LONG time - like at least 30 minutes. I'm glad that wasn't me. I hate having stuff on my face. A big thank you to everyone who helped my Puppy feel better! I'm sending Nose Kisses your way. Anyway, Mom and Dad and Puppy came him late last night and Mom and Puppy are staying home today so that Stuffy and I can nurse Puppy back to health. He's much improved from yesterday. Now I must rest up so I can write another post later on what else I did this week so that you see it before Hallowe'en! Another Archive Picture, BUT Mom has taken pictures of me this week. She's just too lazy to take them out of the camera. That's ok, I still love her. OH! I went to Day Care lat Thursday! I was there ALL day and almost ALL night! Mom and Dad and Puppy went to a Birthday Party for my Great-Grandmother - she turned 90 last week. OH! Mom found a picture of me with her! That's from 2008, but it's a good picture of us. Anyway, she had a great birthday - of course it would have been better if I had been there. Hmmm, what else happened? Puppy is starting to think that my tail is the greatest toy in the world. Yeah, I am NOT happy about that. Mom tries her best but he's hard to distract sometimes. I end up growling at him and Mom yells at both of us. I had some good walks with Mom this week. Around the donut store, near the grocery store and then tonight we just went along the path, Me, Mom and Puppy. I had to dig into the picture archives again. Mom hasn't taken the camera out in a while. But that's ok, she's doing a lot of other stuff with me. I'm getting loads of hugs, ear scratches, you know, the usual. Mom even cleaned my ears yesterday. Blech. I hate having my ears cleaned. But it felt SOOOO good. Sigh. Other than Puppy throwing bacon at me this morning - for which I am very thankful, this has been a pretty boring week. Puppy seemed to have lots of Adventures without me last week. So did Mom and Dad. Puppy came back smelling like Grandma and Grandad. Mom and Dad came back smelling like all sorts of people! Like they had been somewhere totally FUN and EXCITING and they didn't bring ME. Can you believe that? Just for that, I slept on Mom's blanket one night and didn't let her have any of it. 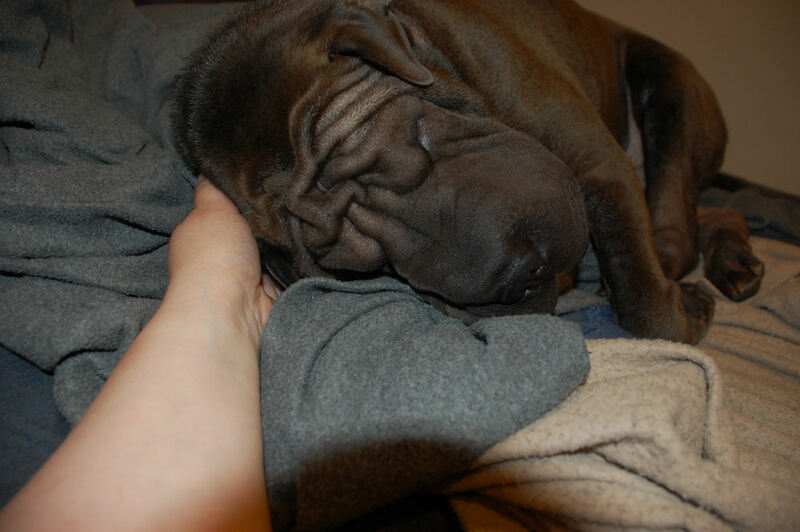 Then, the next night, I slept on Dad's blanket and didn't let him have any of it. Serves them right, don't you think? Has it ever been a busy week here. Mom AND Dad AND Puppy are all sick with colds and feeling all poopy and everything. That means it's MY job to look after them and make sure they're all ok. So you can imagine I have been working my wrinkles off looking after all three of them! 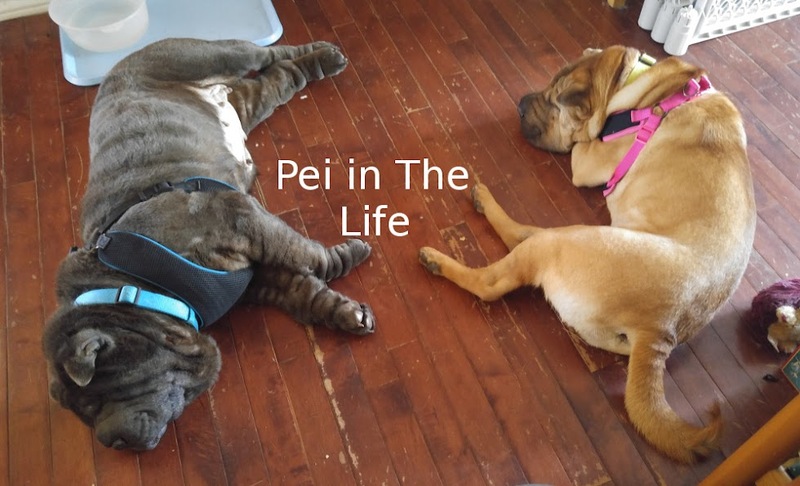 Exhausti-pei-ting! I did spend some time this week teaching Puppy how to play properly. He's getting there. Slowly. And he still offers me food from his plate, so we've been mostly getting along. Not much else to say other than I'd better head back to looking after all of them.